Researchers recently found that young children were more likely to persevere with tedious jobs that they were given to do if they pretended that they were Batman while doing it. 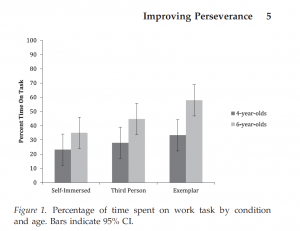 The researchers were studying self-regulation and perseverance in 180 kids ages 4 to 6 years old. The researchers compared 3 test situations: 1. First-person (“Am I working hard?”), 2. Third-person (“Is Billy working hard?”), and 3. Fictional Person (“Is Batman working hard?”). The effects were quite significant. This motivational effect was named after Batman because out of all the characters that were suggested to the children (Bob the Builder, Dora the Explorer, Rapunzel from Tangled, and Batman), children who chose Batman showed the greatest perseverance with the task! To scaffold the idea of roleplay, the researchers also let the Batman role players wear a cape. As for why Batman seemed to be much better than the other fictional characters, a lot of possibilities have been floated. Is it because Batman seems persistent and mentally tough? Is it because he is known to have faced pretty difficult circumstances and still he succeeded? This phenomenon is not just for kids. 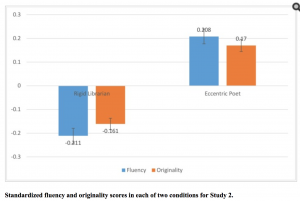 In fact in recent research from Harvard University, undergraduates told to pretend that they are “eccentric poets” were able to generate more creative possibilities for every day objects than if they were pretending to be “rigid librarians” (sorry, librarians – this was their study not ours!). Don’t underestimate the power of imagining you are someone else to help you (or help a student) to become more perseverant, more resilient, and even more creative.